Zeiss has added a fast 28mm prime lens to its Otus line-up in Canon and Nikon mounts. Like the other members of the family, the new wide angle lens has an inner focusing, a dial window and the well-known yellow labeling of the dials. Lens construction is 16 elements in 13 groups. One of the lens elements has an aspheric optical surface and one element is aspheric on both sides. Eight other lens elements are made of special glass. The special glass has anomalous partial dispersion, typical in an apochromatic lens to correct the longitudinal chromatic aberrations. Bright-dark transitions in the image, in particular highlights, are depicted almost completely free of color artifacts, the company said. Focusing ranges from 11.81 inches to infinity on the all-metal prime. The Zeiss Otus 1.4/28 in both mounts will be available worldwide in the second quarter of 2016, the company said. A lens shade is included. The retail sales price has not yet been established. OBERKOCHEN, Germany -- With the new Zeiss Otus 1.4/28, users of shorter focal lengths can now also take advantage of the uncompromising quality of the Zeiss Otus family, whether for landscapes, architectural photography or any other images they take with a wide-angle lens. Where details count, the Zeiss Otus 1.4/28 with ZE or ZF.2 mount for dSLR cameras from Canon and Nikon is the lens of choice. When used with modern, high-resolution dSLR cameras, it offers unrivalled image quality unseen until now in wide-angle photography, even with a wide-open aperture. The Zeiss Otus 1.4/28, a moderate wide-angle lens, particularly shows off its strengths in landscape photography. Even with a maximum aperture, the corners of the image are completely usable, so there are no limits to composition. In poor light combined with fast-moving objects, the lens also excels due to its high speed of f1.4. While other lenses reveal their shortcomings in correction in night photography, especially when lots of open light sources dominate an image, the Zeiss Otus 1.4/28 boasts a stellar performance. Finally, the latest member of the Zeiss Otus family is excellent for taking pictures of image elements in the foreground, as they take on a greater feeling of depth to the scene due to the wide background and the open aperture; here, the lens's harmonious bokeh ensures a 3D effect. 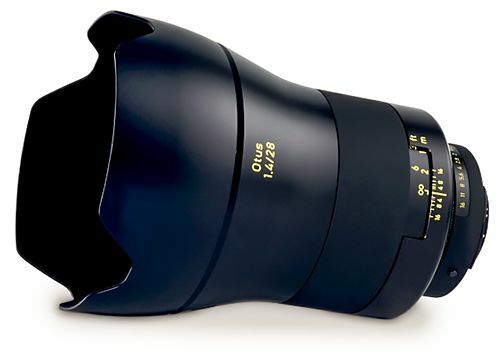 Developed to meet the high demands of professional photographers, the Zeiss Otus 1.4/28 has, like the two other focal lengths in the Zeiss Otus family, inner focusing, a dial window and the well-known yellow labeling of the dials for easy legibility, all of which are already known from professional cine lenses (for example ARRI/Zeiss Master Prime). The Zeiss Otus 1.4/28 also stands out for its mechanical quality: the soft focus operation with the large rotation angle allows for the finest variations when focusing, something that is only possible with a metal construction. In every focusing situation, the user is given freedom to compose, one of the most important creative factors in photography. An artistic tool is literally put in the photographer's hands. The robust all-metal barrel with its easy-to-grip focus ring is well suited for a photographer's demanding everyday work; this ensures a long product life. The optical performance of the Zeiss Otus 1.4/28 is outstanding thanks to its high image contrast all the way into the edges of the image, already at an open aperture. Its consistent performance at all distances (minimum working distance of 0.15 m or 5.19"), the highly detailed images it creates without any bothersome artifacts and the neutral bokeh in the background round out the excellent image quality of the Zeiss Otus 1.4/28. "With these features the Zeiss Otus lenses set themselves apart from the other Zeiss SLR lenses, such as the Zeiss Milvus family, which we recently presented," said Christophe Casenave, Product Manager with Zeiss Camera Lenses. Thanks to these characteristics, the Zeiss Otus 1.4/28 offers users who use a modern high-resolution 35mm dSLR camera a quality that corresponds to the level of the medium format without having to invest in large and expensive medium-format equipment. The lens consists of 16 elements in 13 groups. One of the lens elements has an aspheric optical surface and one element is aspheric on both sides. Eight other lens elements are made of special glass. The basis of the optical design is a Distagon. The special glass has anomalous partial dispersion, as is typical for an apochromatic lens. This corrects the longitudinal chromatic aberrations superbly, which therefore lie considerably below the tightly defined boundaries. Bright-dark transitions in the image, in particular highlights, are depicted almost completely free of color artifacts. The floating elements design (the change of distances between certain lens elements when focusing) allows for unrivalled imaging performance along the entire focusing range, from 0.3 m (11.81") to infinity. When Zeiss introduced the Zeiss Otus 1.4/55 in 2013, creating a new family of high-end SLR lenses, the trade press and users alike were enthusiastic. The Zeiss Otus 1.4/55 has exceeded its promises up to this day. The second member of the family, the Zeiss Otus 1.4/85, which was presented at photokina 2014, continued this success story in the short telephoto range. It enables photographers to express their creativity in a unique way, and that with the unsurpassed high imaging performance for which the lenses in the Zeiss Otus family are known. "The Zeiss Otus 1.4/28 continues the tradition of its lens family. It is the best wide-angle that has ever existed. Now we can offer three outstanding lenses for the widest variety of applications," added Casenave. The Zeiss Otus 1.4/28 ZF.2 and Zeiss Otus 1.4/28 ZE will be available worldwide starting in the second quarter of 2016. The lens shade is included with delivery. The retail sales price is unknown to date.